If you’ve ever felt like you’ve been skunked buying truffles, well, you are not alone. Serious home cooks and even food pros get bamboozled all the time. It’s actually pretty difficult and always expensive to attain good quality truffles, especially for retail customers. In fact, acquiring truffles is so fraught with potential rip offs that it’s easy to wonder if the gastronomic experience is worth the financial risk. My cousin Mario, a retired barber and white truffle hunter, spends every morning during the fall months trespassing all over the chilly little valley in Tuscany where he lives, directing his feisty dog to sniff under this scrubby willow or that. When she smells a truffle she starts digging furiously, and Mario has to yank her aside to retrieve what looks, rather disappointingly, like a small hepatic turd. But the smell! It’s like a sulfuric love bomb went off. If you could roll in the smell, you would. For lunch, his wife Maria serves the little truffles Mario won’t be able to sell, ground with butter and black pepper and spread on a Saltine cracker; and then again, shaved over soft, eggy tagliatelle. On the train ride back to Florence I reek of truffles, which always elicits knowledgeable smiles and nods from my fellow commuters. Lots of language has been used to describe the truffle flavor: mold, garlic, soil, onions without heat, meat, sweet body odor, but those descriptors are beside the point. Truffles are irresistible because their aroma is composed of chemicals that mimic mammalian reproductive pheromones. Eating, even sniffing a truffle is kind of like being drugged. And sorry, it doesn’t make you randy, it just makes you want to eat a truffle. So the truffle experience really is something special. Just keep in mind that knowing a few facts about their weird biology can help you navigate the sometimes (okay, often), duplicitous nature of the truffle business and improve your chances of achieving truffle nirvana. Simply put, an uneducated consumer is the truffle business’ best customer. Truffles are expensive because they are difficult to grow, hard to find in the wild, in decline due to climate change and habitat loss, and in high demand. There are lots of species, but the most valuable ones are powerfully flavorful: the Tuber magnatum pico, the Italian white truffle, and the Tuber melanosporum, the Perigord truffle. Both are in season now, with sales peaking around the holidays. Prices fluctuate, but last year white truffles retailed for up to $350 an ounce—what you’d need to garnish two entrees–and Perigords about $180. Unfortunately, consumers may find their pricey purchases more blah than blow-me-away. 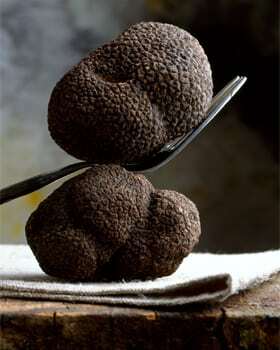 That’s usually because the truffle is past prime and no longer producing the aroma from which its flavor is derived. 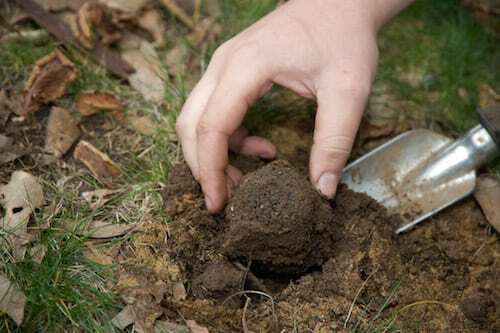 Truffles are mushrooms that have evolved to grow underground. When the spores of the truffle mature, the fungus produces aromatic compounds that attract animals. The animals dig up the truffle and the truffle spores get dispersed. 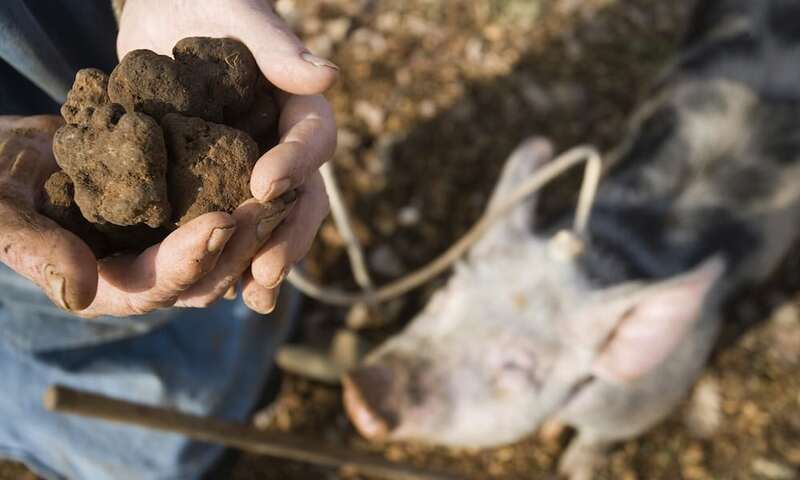 The truffles we prefer to eat have evolved to attract swine (hence the tradition of putting pigs to work hunting them). The truth is, the truffle itself doesn’t taste like much. It is the gas that gives truffles their flavor. In the case of European truffles, that gas starts to dissipate after about 4 days (it’s more or less time for other truffles). So from day 5 on, you may be paying the same for that truffle, but you’re getting less and less flavor. There are really only two ways to enjoy fresh European truffles: go where they come from (like Italy’s Alba truffle fair in October/November, or the Lalbenque truffle market in southwest France in December/January) or buy one that you can see and smell before you pay for it. Internet purchases are risky because it is impossible to know the age of the truffle. “Everybody tries to give good product,” says Rosario Safina of daRosario, a purveyor of truffles, “but it’s hard. There’s just not a lot out there.” Most truffle dealers do their business with restaurants, not with retail customers who buy a single piece, so you’re probably best off ordering fresh truffles at a restaurant. Reputable establishments go to great lengths to purchase the best product they can find. Another reason why a truffle or truffle product like canned truffles may fall short is because you didn’t actually purchase the species of truffle that you thought you were purchasing. Of the hundreds of species described, about 10 have culinary value and they vary in flavor and intensity. Many producers label their truffle products with the Latin binomials (usually in miniscule print) so check to see what species of truffle is in your can or butter or pate. Some are definitely better tasting than others. And if a label doesn’t list the species, buyer beware. Often consumers are misled because many truffle products are not as advertised. Truffles are sold buried in salt, rice, and flour—all in the expectation that those mediums will absorb and retain the elusive truffle aroma. But in fact you’ll find the truffle has off-gassed and lost its flavor, and when the truffle aroma-soaked medium hits the heat, those volatile aromatics are rendered inert and the flavor disappears anyway. When those products do hold up their truffle flavor, it’s probably because the truffle-infused medium is augmented with a chemical additive. Truffle oils, butters, and salts are used as garnishes and most if not all of them are flavored with 2,4-dithiapentane, among other chemicals. There may be some bits of dried truffle in the jar, but they aren’t lending any flavor. Look for labels listing truffle “aroma,” “flavor” and “essence” as an ingredient. Those terms refer to the chemicals. Most truffle oils shouldn’t cost more than the oil itself: One teaspoon of “truffle aroma,” the amount typically used in an eight-ounce bottle of white truffle oil (black truffle oil is made with a lesser quantity of the same chemical) costs about 40 cents. There are producers who claim their truffle oils are natural–Mr. Safina showed me his organic certificates–but the FDA doesn’t police truffle products, so there’s no simple way of knowing what’s in the bottle. I don’t have a problem with chemically enhanced truffle oil. Lots of foods have flavor additives. I just don’t like paying for a product I am not getting. Best practice for a premium specimen: see it, smell it and confirm its species before you buy. 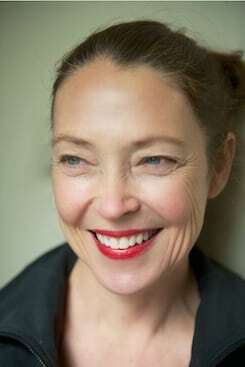 To learn more about food writer and Fantastic Fungi tribe member Eugenia Bone, click here. I’ve tried some Oregon black truffles, Leucangium carthusianum. Very fragrant, and I quite enjoyed the flavor. They are also not as pricey as European truffles. There will still be uncertainty about quality unless you have a dealer that you can trust. Often they are raked out of the ground while unripe — fungal clear-cutting. ¡¡ Excelente artículo!! Sobre todo lo que se refiere a los productos de trufa y los etiquetados, es una verdadera estafa. Nosotros somos productores de trufa fresca, Tuber Melanosporum en Soria (España), las trufas las vendemos recién recolectadas. Somos los primeros interesados en que el cliente quede satisfecho con nuestras trufas, para que entre otras cosas, nos vuelva a comprar mas trufas. España es un gran productor de trufas y hay muchas ferias dedicadas a la trufa en sus distintas regiones, del 20 al 22 de febrero 2015 Feria Trufa Soria en Abejar. 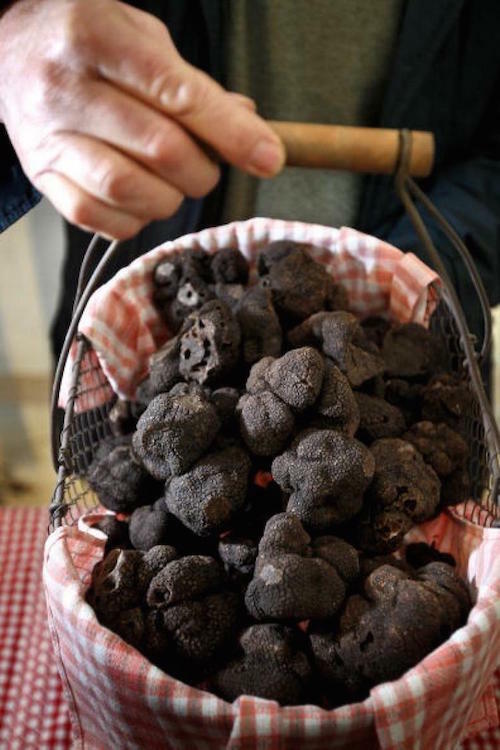 El 80% o 90% de las trufas Tuber Melanosporum de España, se venden en Francia como trufa de Perigord. Dry tree branches, I find the truffles mushrooms. Whatever the size and depth. If you are interested, textual, I see you.